Stock Show competition in Denver, Colorado. The team of five students, includes Lauren Smith (Murdoch University), Jessie Phillips (Charles Sturt University), Felicity Brumpton (University of New England), Jess Davis (University of Sydney) and Nikita Ellison (University of Queensland) and is coached by Sarah Stewart (Murdoch University, Meat Scientist) and Nick van den Berg (MEQ, producer). As well as top honours, the team also took out champion team and individual in lamb judging. It is the fourth year running that the Australians have taken out champion team for lamb judging. Meat Judging involves assessment of beef, lamb and pork carcasses and primal cuts on eating quality and lean meat yield attributes, such as marbling, trimness and muscling. (MLA) and the Australian Meat Processors Corporation (AMPC). Coach Sarah Stewart said that the aim of ICMJ is to build careers and inspire future professionals in the meat industry. 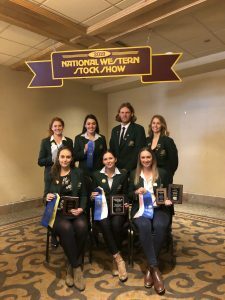 “Meat judging programs and the ICMJ US industry tour accelerates student development and gives them the skills, confidence and professional networks to enter into a career within the industry. In this way we can help grow industry leadership capacity” said Dr Stewart. The National Western Stock Show culminates the training and competitive component of a month long US industry tour. The team will now focus on visiting a broad cross section of the US meat industry, including seedstock and cow calf producers, lot feeders, universities, processors and retailers. The itinerary consists of visits to JBS, Tyson and Cargill beef processing facilities, HeartBrand Beef and Gardiners Angus ranch, Five Rivers Feedlot, Mountain State Rosen lamb plant, Ultrasource and a range of universities, including Texas Tech, Texas A&M and Kansas State. For team mates Lauren Smith and Nikita Ellison, the competition highlighted the volume of young people that are passionate about the industry and the networking opportunities that are available. “It was truly inspiring to see what young people are able to achieve in the sector. For me it really highlighted the opportunities that are available if you have the ambition and passion to grab them” Ms Ellison said. “The trip has been an incredible networking opportunity with people from all across the industry and the US. It has also been awesome meeting students from across the US and forming friendships with the next gen of agricultural leaders” said Ms Smith. The 30th Anniversary of the Australian ICMJ Association will be celebrated at the annual ICMJ conference and competition in Wagga Wagga in July and will host 150 tertiary students from Australian and international universities. ICMJ extends it reach to industry by also coordinating a range of high school competitions, running a Japan industry tour and a week long industry development program for its top 20 future leaders from which it selects the Australian team. For the first time in 2019, ICMJ will also hold the Northern conference in Rockhampton, focusing on the northern Beef sector. For more check out the ICMJ website www.icmj.com.au or follow the tour on Facebook.